September 1985, Chiriquí province, Panamá. A decapitated body is found in a trench bordering with Costa Rica. The remains belong to Hugo Spadafora, an opposition leader. Noriega, the Panama strongman, is seen as responsible for the murder. Years later, this image is still present in the psyche of the Panamanians. The authorities’ way to solve conflicts has not changed much. Since 1985, however, many other things have changed in this Central American country: In 1989, Noriega is swept away by a bloody US military invasion. In 1999, the Panama Canal is handed to the national government by the US administration. Setting of new limits to the Panama Canal Watershed, through the approval of law 20, 21 June 2005. The Canal authority changes the technology in the lock system: water recycling and thus reduction of external water input. A country-wide referendum is launched. The citizens will decide whether the expansion project is allowed and with which technology. The situation can be considered as “solved”. To prevent further conflicts, the government at the time was collaborative enough to set a Watershed Management Committee. 2.-Copper mining and hydroelectricity conflicts in the district called Comarca Ngöbe- Buglé. The situation takes place in a territory with special administration in Western Panama. According to the law, Comarcas are autonomous, and the indigenous population are responsible for decisions pertaining to natural resource use (ca. 200 000 Ngöbes live in that territory). However, the National Government started to promote mining and hydro-power projects in Ngöbe territories before 2009. Cerro Colorado, a large copper ore mine, was about to be granted by the government within Ngöbe territory, a clear violation of the indigenous territory autonomy. The Ngöbe- Buglés organized a first major action in February 2011. This action was a response to the Cerro Colorado lease, and to the increasing amount of hydro-power projects in the bureaucratic pipeline. The Panamerican road was blocked for several days with the support of grass-roots associations from the neighboring province of Chiriquí and Santiago. The government decided to sit at the negotiation table after deadly clashes, and the increased popular support to the Ngöbes’ cause. Spillover effects were already starting in other provinces that have mining and hydro projects. 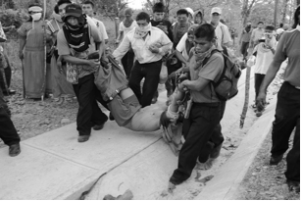 The agreement in 2011 was to declare illegal any mining and hydropower project within Ngöbes’ Comarca. Further, detainees were given amnesty. In January 2012, the conflict arose again. The 2011 agreement was not complied with by the government which pursued with its plans on Cerro Colorado. Ngöbe- Buglés mobilized once more, while acquainted of the imminent start of mining and hydropower projects on their territories. The Panamerican road was blocked during six days as a pressure to get the government to the negotiating table and comply with the 2011 agreements. On February 5th and February 6th, 2012, the government decided not to negotiate but to clear out the roads by force. The clashes resulted in two protesters dead, several wounded, and approximately one hundred detainees. In solidarity, three large unions blocked some roads and protested in major cities. The images of the 2011 clashes and of the 2010 banana strike were still fresh– 70 blind indigenous people due to police intervention. At least three provinces were paralyzed (Chiriquí, Bocas del Toro and Santiago), and others witnessed large disturbances (Colón, Panama). During the following weeks the negotiations between Ngöbe- Buglés and the government are in progress. The legislative is also involved as it has power to modify the legislation on mining and hydroelectricity. It is not clear how the situation will end. The photo credits are for Orgun Wagua. It was taken during the February 2012 protests. The dead is Jerónimo Rodríguez Tugri, a Gnöbe that was in the San Felix blockage when the police spelled them. The other fatal victim was Mauricio Mendez, 16. A young who was in his neighborhood in the outskirts of David, when the Police interrupted to break eventual protests in solidarity with Ngöbe.